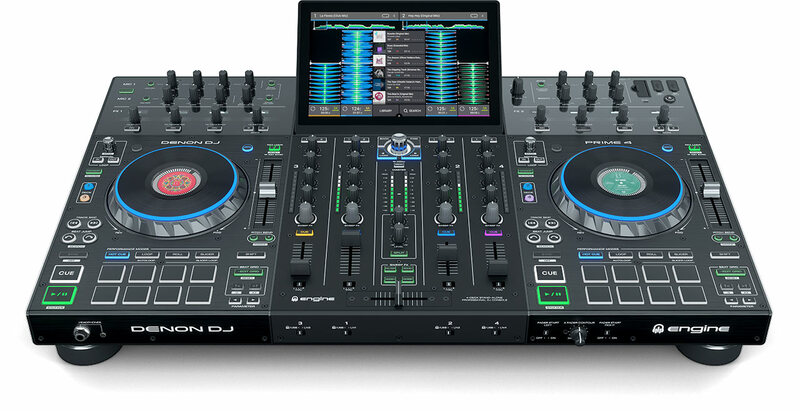 Denon DJ Prime 4 is the most advanced standalone DJ system ever, from the advanced mixer to array of inputs. 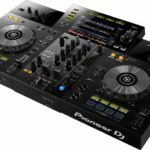 The obvious comparison to this bad boy is the Pioneer XDJ-RX2 although PRIME 4 offers four channels and a whole host of advanced features. Look out for our comparative review coming soon. 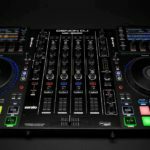 At the heart of the new Denon DJ Prime 4 standalone system is the 10” multitouch, gesture-capable HD display which shows your four track waveforms side-by-side, as well as all the settings you need, when you need them. There are further displays at the centre of each 6” jog-wheel, which give you phase/beat feedback or load custom graphics or album artwork. 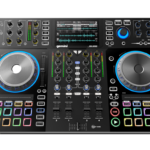 The Denon DJ Prime 4 features a full 4-channel mixer with assignable inputs, each channel has a variety of “Sweep FX” and filters to choose from, alongside two independent insert effects housing 14 unique effects derived from the Denon X1800 mixer. Each of the insert effect parameter knobs has an OLED display above it, to show parameter values for the current control. The new Denon DJ Prime 4 features the eight performance pads which we are seeing become somewhat of a standard lately, these allow you to perform hot-cue juggles, beat-rolls and more. The mixer features two dedicated TRS/XLR inputs for microphones or other inputs, both channels have full control over volume and EQ. 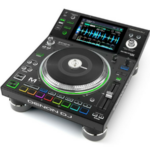 The Denon DJ Prime 4 has four USB ports, two on the top panel and two at the rear, there’s an SD card slot and even a hard drive bay at the bottom for mounting an internal 2.5” SATA drive. 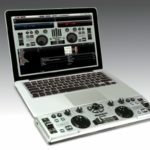 There’s also a USB B for firmware updates and connection to Serato DJ Pro, so you can use the Denon DJ Prime 4 either standalone or as an advanced controller for Serato. There’s a ton of harmonic mixing capabilities, from the high-end time-stretch algorithm, being able to quickly sync tracks based on the harmonic key or adjust the key chromatically. The Denon DJ Prime 4 has a dedicated zone output, allowing you to send a totally independent playlist to a separate room in the venue. The Denon DJ Prime 4 also features StagelinQ capabilities, so you can sync your performance up with visuals from various sources. 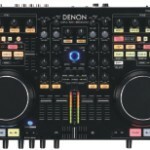 For more information on the Denon DJ Prime 4 check out Denon DJ’s website.